Amsinckia menziesii (Lehm.) A. Nelson & J.F. Macbr. Stem: decumbent to +- ascending, green to brown, spreading-bristly, branches +- many, from base. Leaf: spreading, green, coarse-hairy to bristly. Flower: calyx lobes 5, +- equal, not fused above base; corolla 4--7 mm, tube +- exserted, tube 10-veined near base, limb 1--3 mm diam, yellow to orange-yellow, generally spotted; stamens attached above middle of tube, anthers generally appressed to stigma; style to throat. Fruit: 2--3.5 mm, +- sharp-tubercled, occasionally ridged. Chromosomes: 2n=34. Ecology: Shade-tolerant, open, disturbed areas at forest/woodland edges; Elevation: < 1700 m. Bioregional Distribution: CA-FP, MP; Distribution Outside California: to Alaska, Idaho; naturalized in central and eastern United States; also in South America. Flowering Time: May--Jul Note: Homostylous. Synonyms: Amsinckia menziesii var. 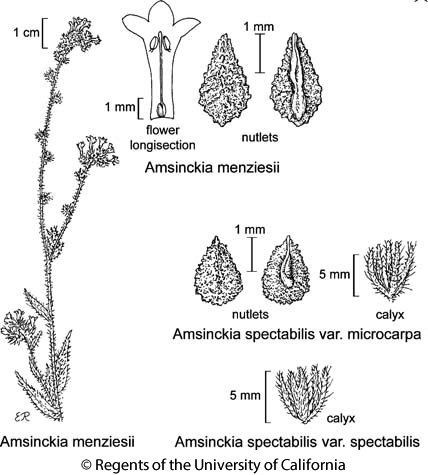 menziesii; Amsinckia micrantha Suksd. Unabridged Note: Occurrence in California in need of verification. See note under Amsinckia retrorsa Suksd. Citation for this treatment: Ronald B. Kelley & Fred R. Ganders 2012, Amsinckia menziesii, in Jepson Flora Project (eds.) Jepson eFlora, http://ucjeps.berkeley.edu/eflora/eflora_display.php?tid=13145, accessed on April 24, 2019.